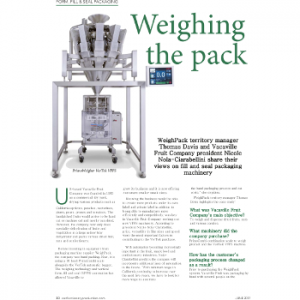 WeighPack territory manager Thomas Davis and Vacaville Fruit Company president Nicole Nola-Ciarabellini share their views on fill and seal packaging machinery. US-based Vacaville Fruit Company was founded in 1960 as a commercial dry yard, drying various products such as California apricots, peaches, nectarines, plums, pears, prunes and tomatoes. The handpicked fruits would arrive to be hand cut or machine cut and mostly sun dried. However, the company now only does speciality dehydration of fruits and vegetables in a large indoor tray dehydrator and packs various dried fruit, nuts and confectionery. Before investing in equipment from packaging machine supplier WeighPack, the company was hand packing. Now, it is using a 10 head PrimoCombi scale alongside the VerTek automatic bagger.The weighing technology and vertical form, fill and seal (VFFS) automation has allowed Vacaville to grow its business and it is now offering customers smaller snack sizes.